That's why our slogan is: WHEN YOU WANT IT CLEAN! A clean home is a happy one and a clean office is a productive one. Our fully trained staff is ready to provide you the cleanest environment possible. Our carpet technicians and business are IICRC certified. We will provide solutions for your most demanding cleaning needs. We love to maintain relationships with clients and become more than just a cleaning service. We want to be part of the routine that makes your life better, healthier, and cleaner. And, the more often we come by, the less work we have to do, and the more you save – not to mention the intangible benefit of living or working in a spotless place. Why spend your time cleaning and not doing the things you want to do? Let us give you the freedom to pursue your dreams. Our residential cleaning services in Chambersburg, PA are provided by top professionals who take great care in keeping your home looking beautiful. Make sure your business sends the right message with a neat and clean presence. 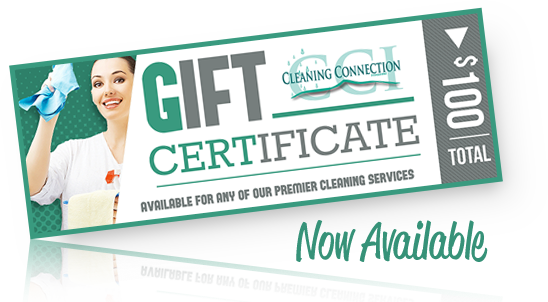 CCI Cleaning Connection, Inc's commercial cleaning services in Chambersburg, PA will maintain the clean and professional atmosphere your business deserves. Let us provide a fresh and healthy environment for you and your family. We provide the best carpet and upholstery care in Chambersburg, PA. Protect your investment and allow our professionals to maintain that fresh look and feel. We handle all types of hard floor surfaces. VCT, Terrazo, Concrete and Hardwoods just to name a few. Our floor care professionals in Chambersburg, PA will help maintain that "like new" shine and rejuvenate your floor surfaces from daily wear and tear. Commercial or residential, let our professional and experienced staff transform your project site to "move in" ready. At CCI Cleaning Connection, Inc. in Chambersburg, PA, our construction cleaning services can help transform any job site into a presentable and safe environment. Yes, we even do windows! Let us keep those windows sparkling clean. Our window professionals in Chambersburg, PA take great care in keeping your view of the outside world clean, crisp and beautiful.